Focus group members at West Lordenshaw 1D. At the beginning of November the Heritage and Science: Working Together in the CARE of Rock Art project held its second focus group, this time for rock art non-experts. The event involved nine non-experts. 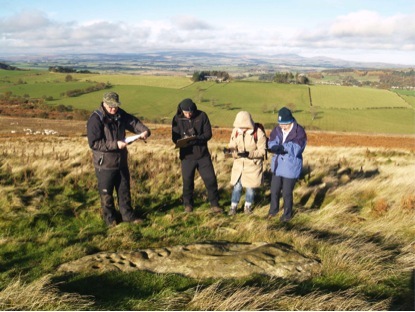 Along with the project research team, the group visited the rock art site at Lordenshaw in Northumberland National Park to test out the draft tool kit, which is one of the key deliverables of the project. A discussion was then held in Rothbury to gain feedback on possible improvements and changes to the tool kit. The participants were mainly drawn from North East ramblers groups so they were certainly prepared for any conditions. However as it was the weather was perfect. The low autumn sunshine really picked out the rock art in a spectacular way. West Lordenshaw 2C in the autumnal morning light. The feedback on the tool kit was vital as part of project aim is to co-produce its resources. There was lots of very useful feedback provided by the group, such as pointing out it was sometimes hard to distinguish a difference in the condition of motifs. An expert, such as Dr Mazel, is so used to seeing many motifs that this issue hadn’t been considered. The end product will help protect open-air rock art by creating a means for anyone to quickly evaluate the condition of rock art based on scientific research into potential risks to the stone. 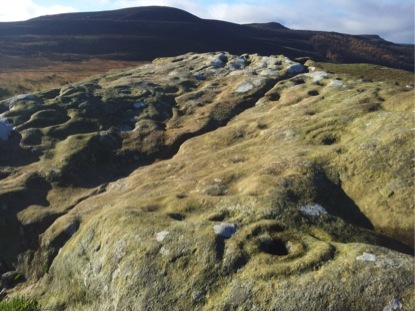 To join the wider discussion about rock art in the UK and Ireland visit the project on Facebook. This entry was posted in Current Research and tagged archaeology, participation, rock art. Bookmark the permalink.